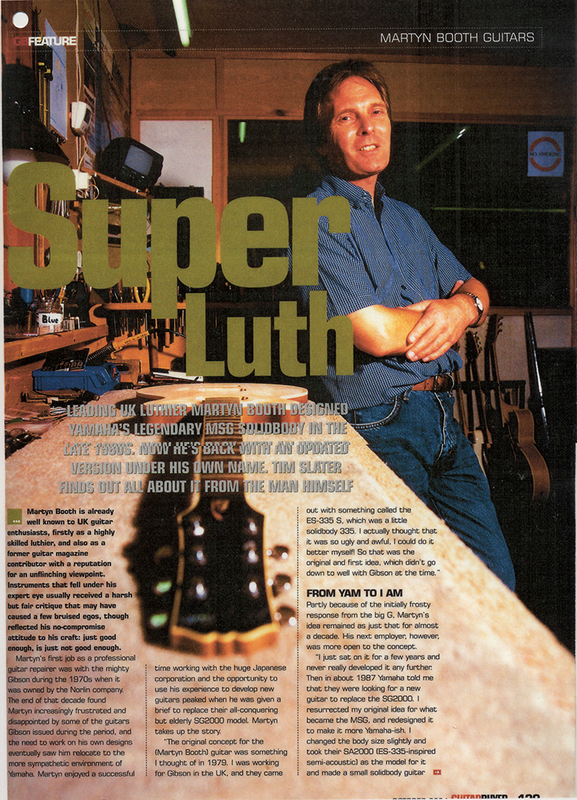 Martyn Booth is already well known to UK guitar enthusiasts, firstly as a highly skilled luthier, and also as a former guitar magazine contributor with a reputation for an unflinching viewpoint. Instruments that fell under his expert eye usually received a harsh but fair critique that may have caused a few bruised egos, though reflected his no-compromise attitude to his craft: just good enough is just not good enough. Martyn’s first job as a professional guitar repairer was with the mighty Gibson during the 1970s when it was owned by the Norlin company. The end of that decade found Martyn increasingly frustrated and disappointed by some of the guitars Gibson issued during the period, and the need to work on his own designs eventually saw him relocate to the more sympathetic environment of Yamaha. 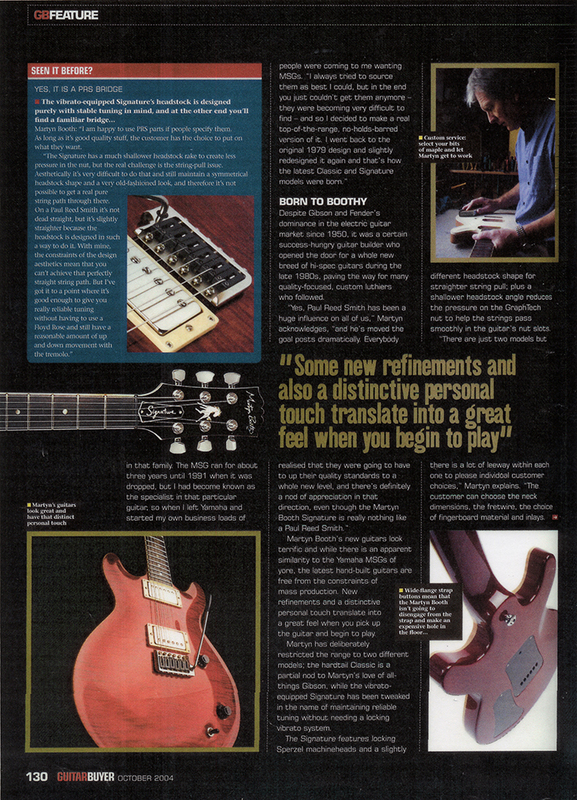 Martyn enjoyed a successful time working with the huge Japanese corporation and the opportunity to use his experience to develop new guitars peaked when he was given a brief to replace their all-conquering but elderly SG2000 model. Martyn takes up the story. Despite Gibson and Fender’s dominance in the electric guitar market since 1950, it was a certain success-hungry guitar builder who opened the door for a whole new breed of hi-spec guitars during the late 1980s, paving the way for many quality-focused, custom luthiers who followed. Martyn Booth’s new guitars look terrific and while there is an apparent similarity to the Yamaha MSGs of yore, the latest hand-built guitars are free from the constraints of mass production. New refinements and a distinctive personal touch translate into a great feel when you pick up the guitar and begin to play. Martyn has deliberately restricted the range to two different models; the hardtail Classic is a partial nod to Martyn’s love of all things Gibson, while the vibrato equipped Signature has been tweaked in the name of maintaining reliable tuning without needing a locking vibrato system. The Signature features locking Sperzel machineheads and a slightly different headstock shape for straighter string pull; plus a shallower headstock angle reduces the pressure on the GraphTech nut to help the strings pass smoothly in the guitar ‘s nut slots. “There are just two models but there is a lot of leeway within each one to please individual customer choices,” Martyn explains. “The customer can choose the neck dimensions, the fretwire, fingerboard material and inlays. Unlimited access to every fret is one of the principal joys of playing the Martyn Booth guitars. His early references to Yamaha’s ES-335-inspired SA series has resulted in a neck with good access to all of the 22 frets. With no bulky neck heel to hinder you, you can easily soar way beyond the 19th fret into territory where Les Paul players, and especially those with small hands, begin to struggle. For extra strength the glued-in mahogany neck has an extra-deep join, which is identical to those found on old Gibson Les Pauls from the 1950s, but this neck’s slender and downright speedy profile feels closer to a mid-1960s ES-335 than the standard clubby ’59-style Gibson neck. 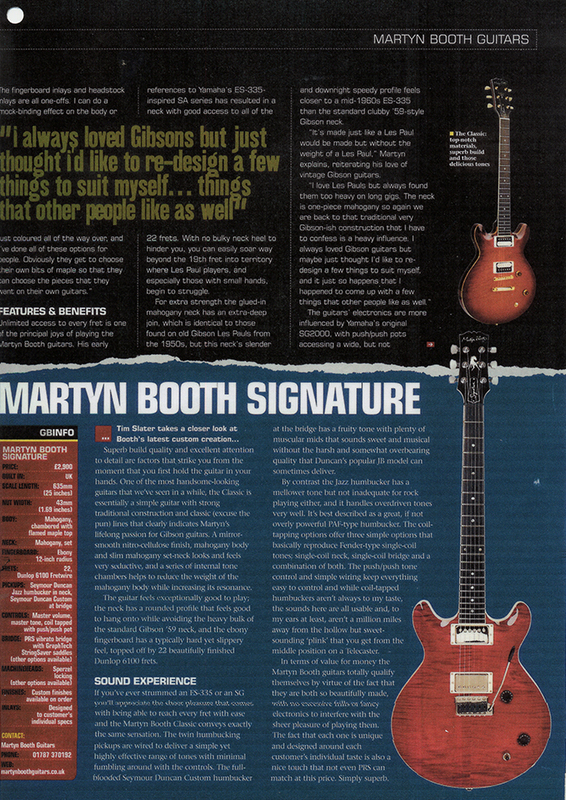 “It’s made just like a Les Paul would be made but without the weight of a Les Paul,” Martyn explains, reiterating his love of vintage Gibson guitars. The guitars’ electronics are more influenced by Yamaha’s original SG2000, with push/push pots accessing a wide, but not confusing collection of tones. In fact, Martyn prefers to keep things simple; confining his guitars to three humbuckirig and three singlecoil options as standard. “I prefer to offer my guitars with two humbuckers that are coil-tapped,” he comments. “That’s so that you get three Gibson sounds and three Fender-ish-type sounds from the guitar with only one push/push pot. It’s all very simple. You don’t have to pull any knobs, it’s just a quick flick down and when the push/push pot is downwards you get three Gibson-type sounds and with the push/push pot up you get three Fender-type sounds, and it’s just so simple to use on stage. I’ve always felt that the last thing that you want to be worrying about ‘ on stage is fiddling around with lots of knobs and switches. 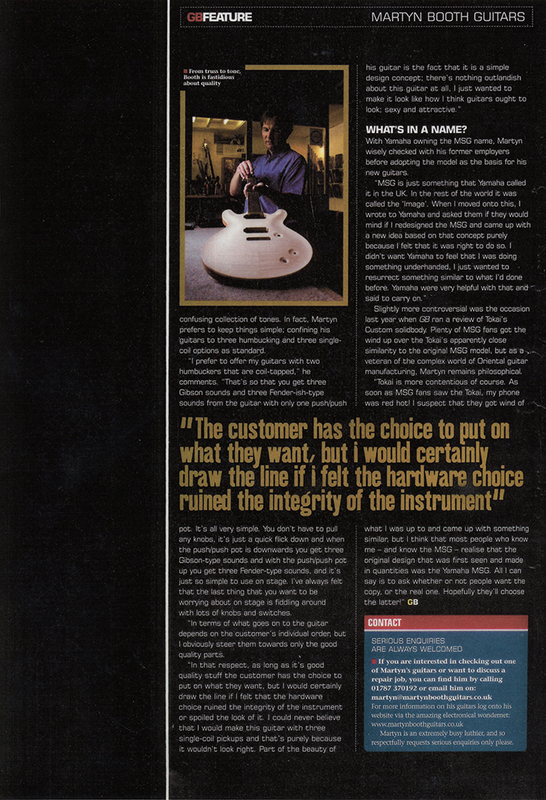 With Yamaha owning the MSG name, Martyn wisely checked with his former employers before adopting the model as the basis for his new guitars.